Here you have a super easy delicious recipe! You can either make it in the slow cooker, the stove or in the oven! Enjoy! In a bowl or saucepan, combined the buffalo sauce with the honey and butter, stir, and heat up until the butter is melted. ( heat up in the microwave or on the stove.) Set aside for a minute. Season the chicken pieces with salt, black pepper and garlic powder on all sides.! Season really well. Place the chicken pieces in the slow cooker bowl. And Pour the buffalo sauce mixture all over the chicken pieces. Cook in the slow cooker on low temperature for 7 hours. After 5 minutes, remove them from the oven. Brush them with more of the sauce, then serve them. 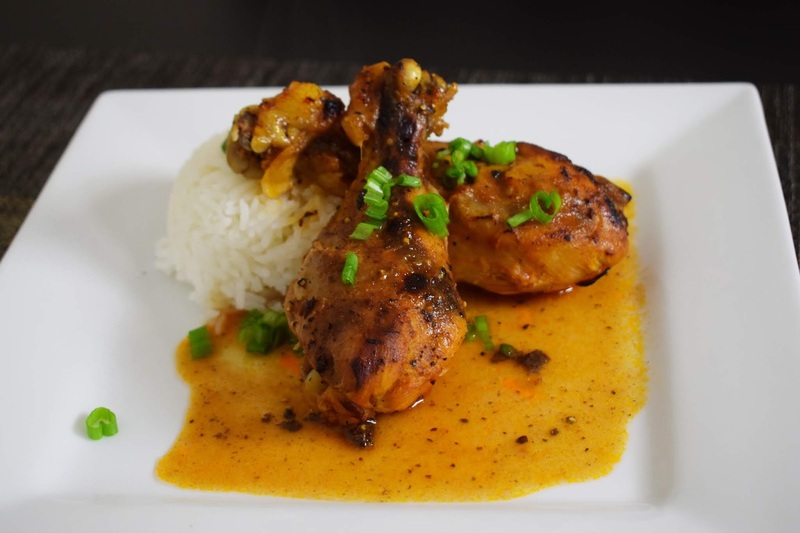 Serve with white rice, add a bit of the sauce on your plate, then place the chicken on top of the sauce, and garnish with chopped green onions! In a large skillet or saucepan on high heat, heat up two tablespoons of olive oil, brown the chicken for about two minutes on each side. Pour the buffalo sauce mixture all over the chicken pieces, reduce the heat to low, cover the saucepan with a lid, and cook the chicken pieces on low heat for about 60 minutes or until well cooked. Serve with rice and pour some of the cooking sauce all over the chicken. Garnish with green onions. Place the chicken pieces in a baking dish. Remember to season the chicken pieces with salt, black pepper and garlic powder on all sides. Pour the Buffalo sauce mixture all over the chicken pieces. Cover the baking dish with aluminum foil. Bake the chicken pieces at 350ºF for 45 minutes. After 45 minutes, set the temperature to 400ºF. Uncover the chicken, and cook for 10 more minutes or until well cooked!